Following his military career in World War II, infantry captain Frederico Saldana began building a series of small vehicles, drawings of which he had published in magazines earlier on. Prototypes were built in 1950 in Bilbao, but production began in earnest in San Aunan de Desas near Barcelona. The first was the Kapiscooter, a two-in-front three-wheeler with V-front two-tone paint and 125cc Montesa engine, built until 1955. Parallel to this came the one-in-front three-wheeler "Topolino" with 197 Hispano-Villiers power. 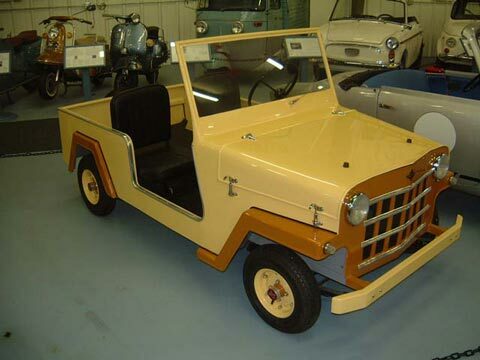 There followed the JIP, of which this car is an example, patterned after the American Army Jeep, and using again the 197cc Hispano-Villiers. The prototype was from Burgos, and production was from 3 addresses in Barcelona. This is the oldest, and one of the rarest Spanish cars in the museum. Other vehicles included the Platillo Volante ("flying saucer"), the Lujo ("luxury") resembling a Fiat 600, and the M190, a brazen scaled-down copy of a Mercedes 190SL but with a one-cylinder engine. The prolific Captains efforts ended in 1956.